Do you ever go through style phases where you are obsessed with one particular color or pattern? I definitely do; and right now I can’t get enough of emerald green. I always tend towards deep jewel tones in January and February – something to do with the dark/cold weather here in the Pacific Northwest. I think I love emerald so much this year though because it is so versatile! Emerald green looks great with navy, black and white, leopard print, rust… so many complimentary colors! 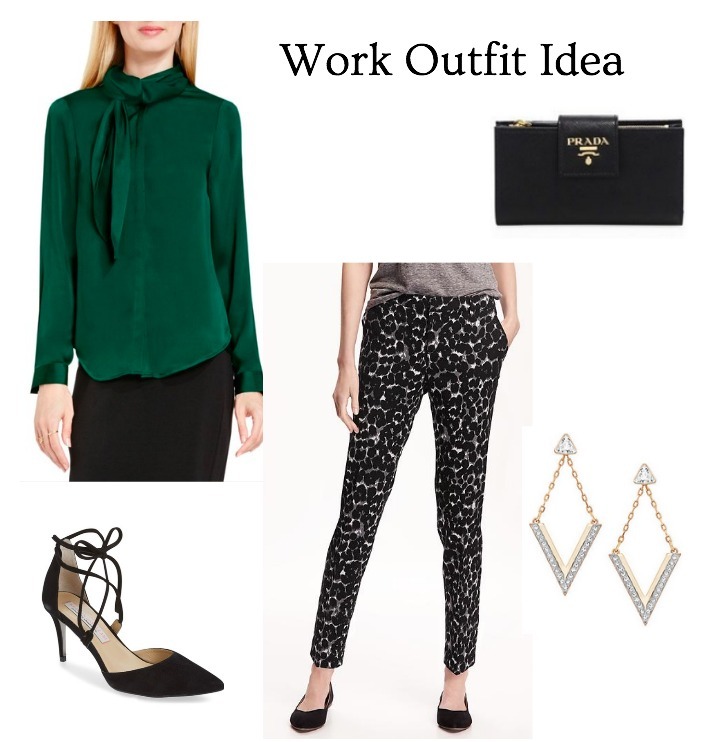 For this week’s work look I wanted to feature this gorgeous tie neck blouse I have had my eye on. I decided to go for a bold look and pair it with these snow leopard pants from old navy. I have these pants in a couple of colors – they are the PERFECT (and cheap) work pant. For this week’s weekend look, I went with a date night look. I love this strapless jumpsuit and decided to pair it with bold bracelets on each wrist. Also, how bad-a$$ are those gold studded heels?! #obsessed. In other news, I’ve hopped on the Whole 30 bandwagon (i know, i know… it’s a bit of a fad) but, I have about 14 million food allergies, so I really like the idea of trying to cut out some junk from what I eat. I am a total newb to Whole 30 though, so if you have any favorite recipes that are Whole 30 approved, please let me know! Have a great week everyone! "Top Posts of 2016 (and questions for you!)"